First you need some daylilies, Hemerocallis blooming at the same time. They need to be of the same type, Diploid or Tetraploid. Our trio above had a late June tryst, assisted by the Fairegardener who plucked a flower from H. ‘Dave Rhyne’ and tickled the fancies of H. ‘Heavenly Treasure’ and H. ‘Elegant Candy’ on one fine midsummer day. Romance was in the air. The flower stalks on the female plants were tagged with the names and date of pollination. Then we waited for a pod to form. Then we waited for the pod to ripen, open and expose the seeds inside. Freshness counts. The seeds were planted in four inch pots about one half inch deep in seed starting mix covered with chicken grit and set in a shady spot outdoors where they could be watched for the babies to show their heads. The time from seed planting to babies was a few weeks. 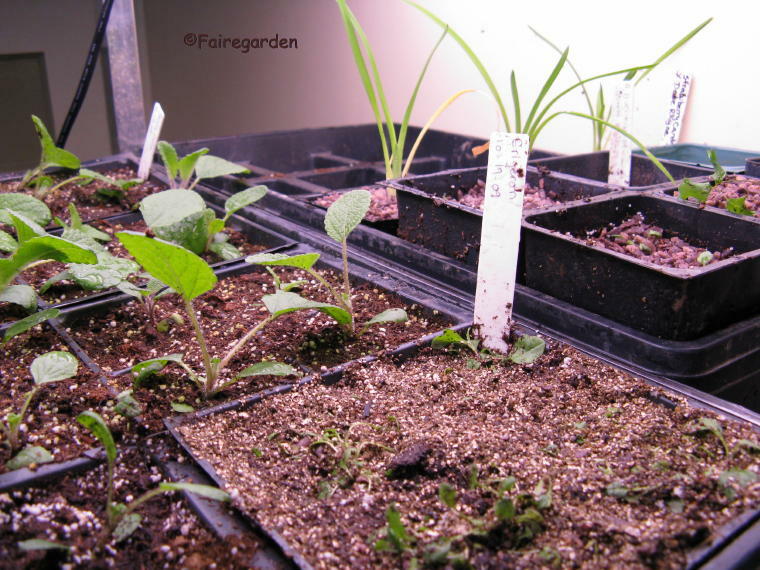 When the weather turned colder, nights below 50 F, the pots were brought inside the greenhouse. 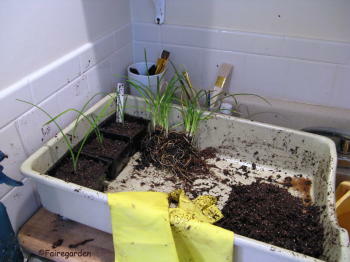 Having a greenhouse is optional for this to work, as is the whole potting process. 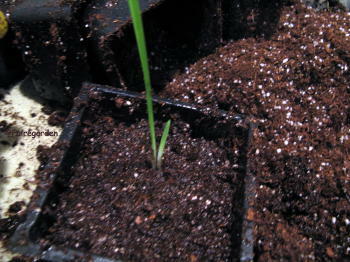 The ripe seeds can be sown directly into the ground and will grow. 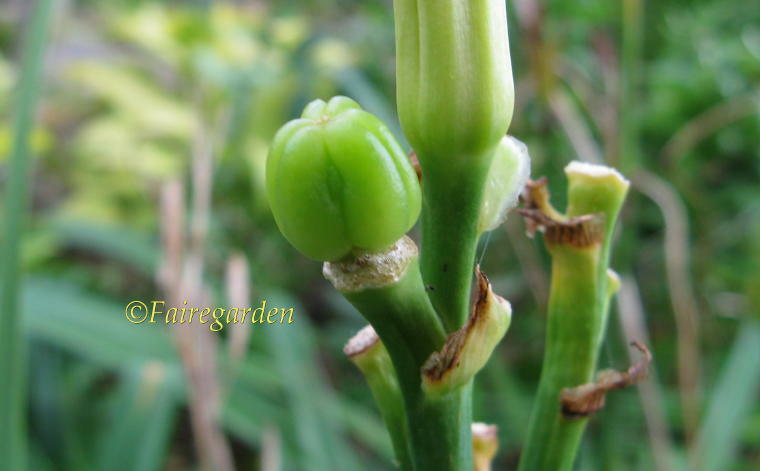 It just takes a whole lot longer, several years, before the seed grows into a flowering size plant. This extra work is being done in hopes of getting blooming sized plants sooner. 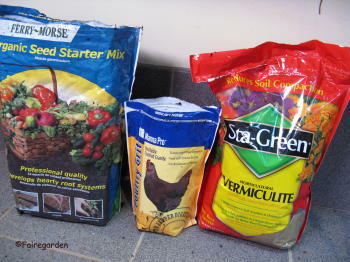 I use a bagged seed starting mix, purchased at the big box store. 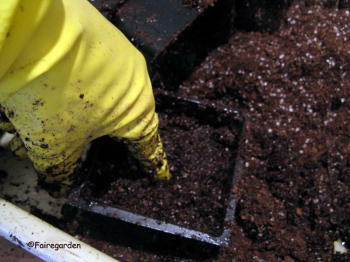 When sowing all seeds, we use either chicken grit or vermiculite as the top layer. This prevents disease and keeps the leaves cleaner from soil splashing when being watered. 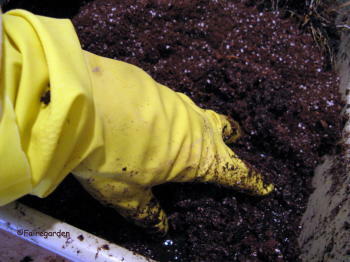 Latex gloves and a tray help keep the messiness to a minimum. Our greenhouse has a sink, the old kitchen sink from the main house renovation project, and a drain in the tiled floor. We save pots and trays from plant purchases to reuse. We do not sterilize them. We are lazy that way. Onward. Moisten the potting mix very well. VERY WELL. 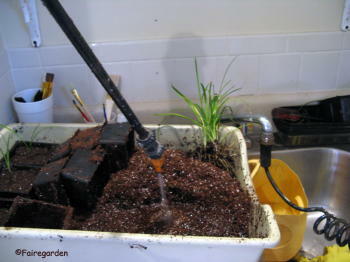 Do not skip this step or worry about too much water, it will drain out the bottom of the pot. I use my hands to make sure it is wet, like mixing cookie dough. Hands are the best tools in the world. Fill the pot about two thirds full, tamping down and make a depression in the center with your index finger, about one inch in diameter. Gently separate the seedlings, pulling the roots apart trying to break as few as possible. There will be some breakage anyway, don’t worry about it. Form the rootball into a shape that will fit into the depression you have made with your index finger and insert it into the pot. 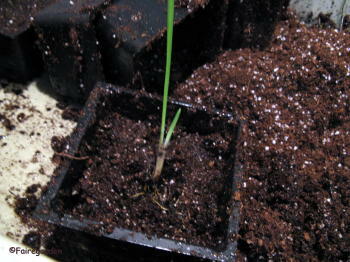 Holding the stem carefully, add more moist potting mix around the stem and lightly tamp to secure the little plant baby. Aw how cute! 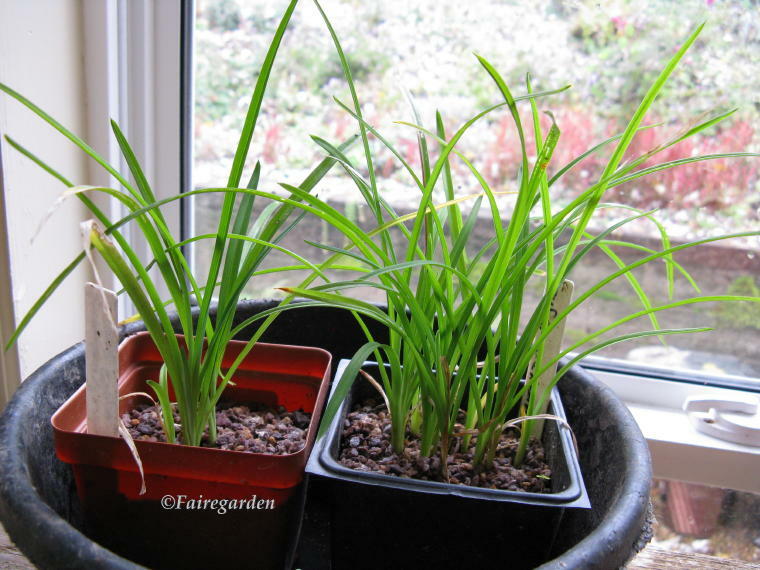 There were only three seedlings produced from the cross of Elegant Candy and Dave. The label is wrong, it says Strawberry Candy instead. The same Dave flower was used to pollinate both females, Heavenly apparently getting most of the pollen. Lesson learned, use a new flower for each encounter. 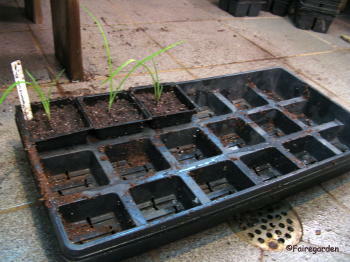 The other seedlings are the larger Salvia transsylvanica from purchased seed and Erigeron kravinskianus just repotted. And now the big finish! Sixteen seedlings of the cross of Heavenly Treasure and Dave Rhyne. The other two pots contain more Erigerons. There are bound to be some deaths, there always are. That is why it is a good idea to have extras. These crosses may not result in flowers that even look like either parent, there might be vast differences between them. The plants may not be healthy or vigorous, but both parents are superior daylilies and the mother was listed as a very good female for breeding when the research was being done to begin this project. It remains to be seen what the outcome will be from these efforts. 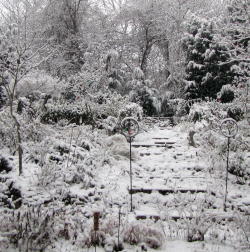 But so far it has been fun and rewarding, keeping us busy with real gardening during the colder months. The seedlings are sprayed with a very weak solution of organic fertilizer every other day or whenever I remember to do it. They will be kept moist but not soggy. The grow lights are set to shine for fifteen hours. A fan runs to circulate the air 24/7. The temperature is cool, warming up when the sun shines and dropping to no lower than 50 F at night, using the heating system of the house with a vent in the ceiling. For more information about the greenhouse/sunroom, click to read one of our earliest posts, here, The Greenhouse/Sunroom . There will be updates when and if there is something to write about, like flowers, someday. This entry was posted in How To, Seeds. Bookmark the permalink. Seriously you just tickled the pollen right on the other flower? I’ve been wanting to learn more about hand pollination..hopefully this will be my after Christmas research topic. Do keep us informed of the progress here. Frances, this is an exciting project, the anticipation, I can feel it over the miles! I can see why people just breed more and more varieties, very addictive! Looking forward to the results. Hi Lisa, thanks. The mystery here is what the flowers will look like, but there are other things that are inherited from the parents, such as flower form, ruffles, height, size of bloom, vigor. Seeds from daylilies that I noticed and planted years ago took five years to bloom outdoors. I hope this is faster. While this is not a real greenhouse with all glass, it is just a room with many windows and skylights, the grow lights make this a project that could be done anywhere, even a closet. Thanks for showing all of us how this is done! Very exciting to see the outcome. What a fun breeding experiment to try. I can’t wait to see what flowers you get. I guess I have a long wait, but I can be patient if necessary. I can’t wait to see how they turn out! I attempted to cross pollinate some daylilies this year but never went back to collect the seed. Perhaps I’ll make another attempt this year since I’ll have more room to grow things with the greenhouse-shed. 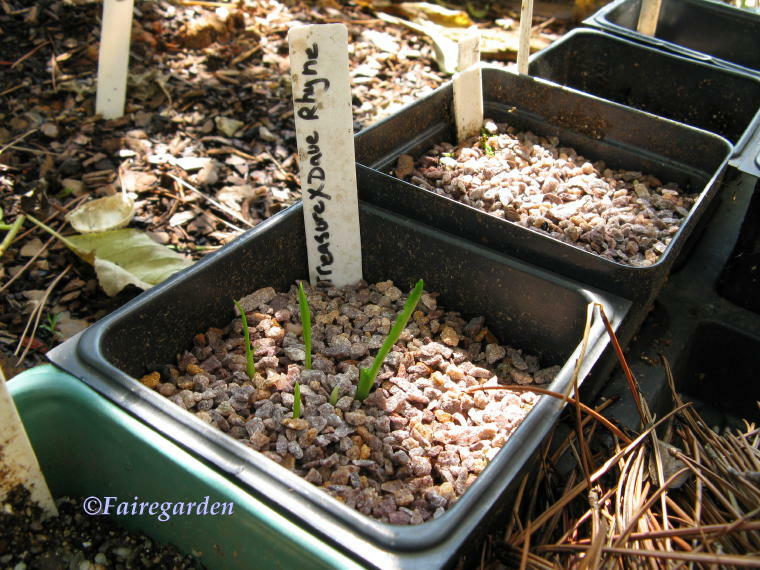 Hi Frances, Five years from fertilization to possible bloom…Daylily Plant Propagators are very patient people! Even with a wait of a few years, I find this very exciting. It’s easy to see how folks could get hooked. Just looking at the parents and wondering if the offspring will have yellow ruffled petals with a green eye or even if it could end up with no ruffles! I assume that daylilies cross all the time with the help of bees? gail Thanks for showing this How To. 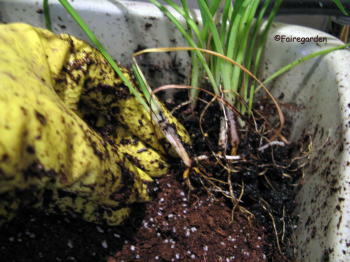 Like everyone else, I look forward to seeing the appearance of your brand, spanking new daylilies. I’ve never gotten into hand pollination and marvel at those with the patience to breed new varieties of plants. I giggled while reading your response to Darla. I tend to forget that plants are sexual, too. Great post, thanks so much. Luther Burbank, move over–here comes Frances! Seriously, this is very interesting, Frances, but most of all I admire your patience. I don’t know that I would be patient enough to wait five years to see the resulting blooms. It will be interesting, though, to see how these seedlings turn out. How cool. I love the science of gardening as much as the beauty. Who knows what you will have when they bloom. It’s like a present that will open a year down the road. I hope you get a very pleasant surprise. I’m so glad you are breeding plants! I think all gardeners should be doing it. So easy, and so much fun! I try crossing just about everything I grow… It is kind of an obsession. I’m excited to grow up check out a bunch of tomato hybrids this year, along with oodles of other fun stuff. Plant breeding is the best! Oh, I think this is wonderful. I’ve wanted to breed my own flowers before, and it’s so inspiring to watch someone get in there and do it. Just think what you could end up with! The next must-have daylily could be one of those teeny babies, and definitely you will learn so much from the process, even if the blooms are not your favorites. Congratulations on a fabulous project! And mine still haven’t shown up yeat =( but there’s still hope isn’t there. Hi Gittan, there is always hope. I wish your daylilies to be strong and blooming. It’s a really good project and I hope you have some pleasant surprises. Once you plant out the Erigeron you’ll never be without. Made me smile, ‘first you need some daylilies’, it’s a bit like creating a cottage garden, ‘first buy a cottage’. Do you need music during the process? Something sultry to get them in the mood? You are amazing… I may not ever do this, but then again… maybe I will (someday in a sunnier garden). 🙂 Thanks, Frances! I love seeing new, baby plants. 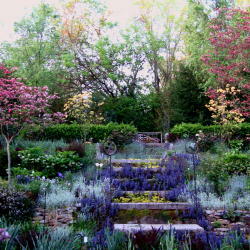 I have always thought of creating new varieties of flowering plants. I used to have Daylilies with Erigeron karvinskianus planted around them. Just loved the combination. I gathered some seeds from someone’s daylily bed. 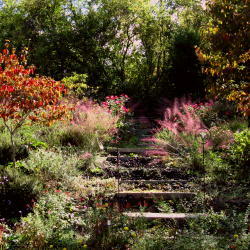 ‘Help yourself,’ she said, ‘I tried planting some once and they were UGLY.’ Well, from that handful of seeds I got a pretty pale pink with a lavender eye that I gave the garden name of ‘Meet my Sister’ and a red that I could hardly distinguish from some important reds I bought. There was even a bright gorgeous orange that I’ve forgotten where it went. My opinion is that our own crosses are as important as those fancy-dancy hybridizers’ wares, because they are ours alone, one of a kind. Priceless, Frances, and thanks for the (always) great directions! Glad I’m not the only one who loves using my hands and can’t be bothered to sterilize! This was really interesting! Can’t wait to see what the flowers look like. Would love to see how the flowers turn out. Interesting post and I liked going through the entire process. The blooms in the first set of photos are stunning! Thanks Kanak, glad you liked this post. The parents chosen were some of our very best daylilies, so we are hoping that follows the gene pool into the babies. So far they are growing nicely in the greenhouse. Hi Carol, thanks. I am excited to see flowers of any kind from this at some point. You don’t need a greenhouse, just lights. I am a true believer after getting them last year and seeing what a difference it makes with the growing of things underneath them. Comments last year said people even had them in closets. Frances, it all looks very professional. I’m very keen to see how/if the ruffles, watermark make it through and what the colour will be. 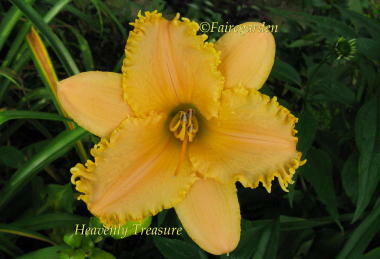 I adore those daylilies with the chartreuse colour at the throat. That sounds like raising a child. I do hope you have much success. Thanks for the info, I can’t wait to see how they turn out….you make it sound so easy! I got stuck at the very first step. No daylilies here. I dont think I’ve ever seen one. But I think I’ll save this anyway ( just in case a miracle happens and I do get one). Thanks, Frances. A hundred and fifty years ago, home gardeners often bred their own plants; I’m glad to see you’re promoting a revival of the custom! Great info. I wish I had a greenhouse! PS: I love the cedar waxwings in your header photo. Great info and pictures, Frances. I look forward to getting updates from time to time on their progress. I was torn between making a smart-aleck comment about what kind music did you play, or if you offered them a cigarette afterwards. But sheer scientific interest won out. I found it quite interesting that you didn’t feel a need to sterilize your equipment–a lady after my own heart! Thanks Jenny. I like smart aleck comments as well as sweet ones. HA As for the sterilizing, perhaps I am losing some plants because of that, but there will always be losses and I am lazy. If there has been disease in a pot, it goes to the recycle after being washed with the hose. Bleach is rarely used here, a last resort even inside. Reading this post of yours is like attending a tutorial. The wonder of it all is that I feel like I am witnessing the birth of life and I am extremely curious what the babies/youngsters will look like. A process of making natural babies, not clones. How very interesting. Plants can’t talk and move much but they give us so much satisfaction when they grow and bloom. 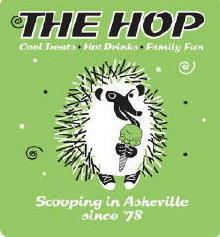 Thanks Autumn Bell, that is the idea behind the how to posts. This year we had some daylily babies flower that had been sown from gathered seed off the plants. It took five years for flowers and the babies were similar to the parents. We shall see how this arrangement works, hoping for a quicker flowering with the use of the lights. I agree, Frances, I cannot imagine an ugly daylily. They are just about my favorite flower, (except for all those others!) and I am always so happy to see them blooming! I seldom sterilize either. I don’t have time for all that! Very informative post. Thanks! But I do have a question. 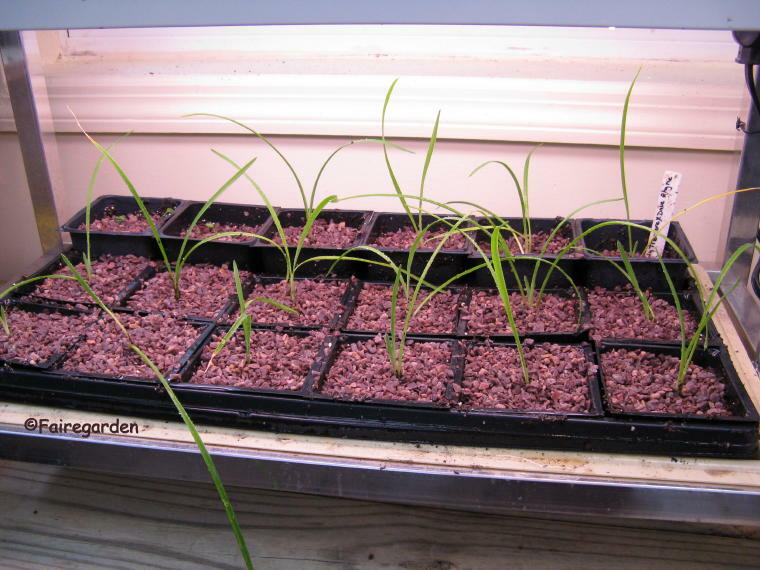 How do you know if your plants are diploid or tetraploid? Hi Zach, thanks and welcome. The only way I know is to check them out on some online sites, like Dave’s garden. You need to be sure of the name. I used ones that were purchased from a reputable local daylily breeder. 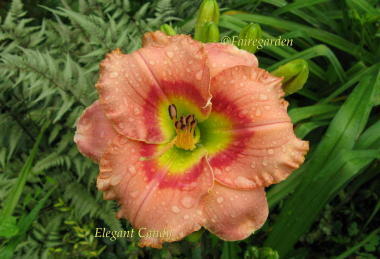 His site also will list if they are dips or tets, Champion Daylilies. 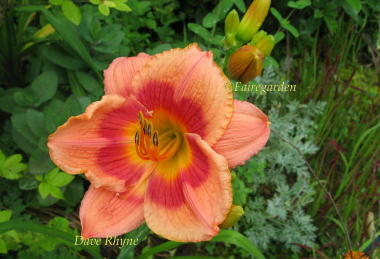 There is also good info about breeding daylilies on his site. What a great post, I love daylilies. Your pictures take me back, I worked in greenhouses for years, and did countless crosses and potting of seedlings. I am crazy about planting trays, colour coded tags, making potting mixes and watching the little ones grow. Wonderful post! What a delightful story. I learned quite a bit reading this, Frances. Thank you so much for sharing it. You are a truly patient gardener. I can’t wait to see these when they flower.